There are two different methods of performing the procedure, strip harvesting (FUT) or Follicular Unit Extraction (FUE). This page is dedicated to explaining the strip harvesting method and listing a series of frequently asked questions. Please scroll down for FAQ. Dr. Sean Behnam has perfected his strip hair transplant procedures such that patients have minimal downtime, minimal scarring, and most importantly, great results. Hair transplant is more than just a medical procedure, it’s an artistic process that must be carefully planned and executed. Dr. Sean takes pride in his thorough hair loss examination as well as his one surgery a day philosophy. The advantage of strip hair transplant over FUE is that a patient can usually get more grafts/hair in a single procedure. Also, strip procedures are less expensive. What is a Strip Hair Transplant? A Strip Hair Transplant is a procedure where a strip of skin is taken from back of the scalp (known as donor area). The hair transplantation grafts are then individually dissected under a powerful microscope. Each graft is then transplanted in the areas of balding. On average, each hair graft has 2 to 3 individual hairs. Often patients who are considering hair transplant are scared of the scar that might be left from a strip procedure. Those patients have seen pictures of patients who have had procedures that left a wide scar. Those scars were usually a result of old techniques. Dr. Sean goes through great lengths to make sure his patients have the smallest scar possible. Most of his patients, depending on density, can cut their hair down to one half of an inch without the scar being visible. Patients who cut their hair shorter than a half of an inch are probably better candidates for FUE. Each follicular unit or hair transplantation graft has 1 to 4 hairs. Using current techniques, at the end of the hair transplant procedure, patients can leave with only a headband. Patients can wash their hair the next day. There are many aspects to a successful hair transplant. A natural looking hair transplant involves planting hair transplantation grafts in a manner to present natural hair line and natural looking hair growth. The way Dr. Sean creates the recipient sites determines the aesthetic look of the transplant. He carefully sets the angle at which the new hair grows and determines the distribution and density of the grafts. This is a critical aspect of hair transplant surgery that requires considerable experience, surgical skill and a keen aesthetic sense. Our free hair transplant consultation page also gives you ample information about the procedure and what to expect. The images above show a mastery in the art of refinement, blending, balance, proportion, and shading. Dr. Sean consider all aspects of every hair transplant- natural variation in color, texture, and direction. Dr. Sean dedicates a full day to each surgery. These are outpatient surgeries that do not require general anesthesia. A local anesthetic is sufficient. Patients are provided lunch and a relaxing atmosphere. The building is a Class A Medical building and the equipment is state of the art. Yes, Dr. Sean has performed over 1,000 cases safely and successfully. Yes, no one will notice any work was done. People just notice you have more of your own natural hair. 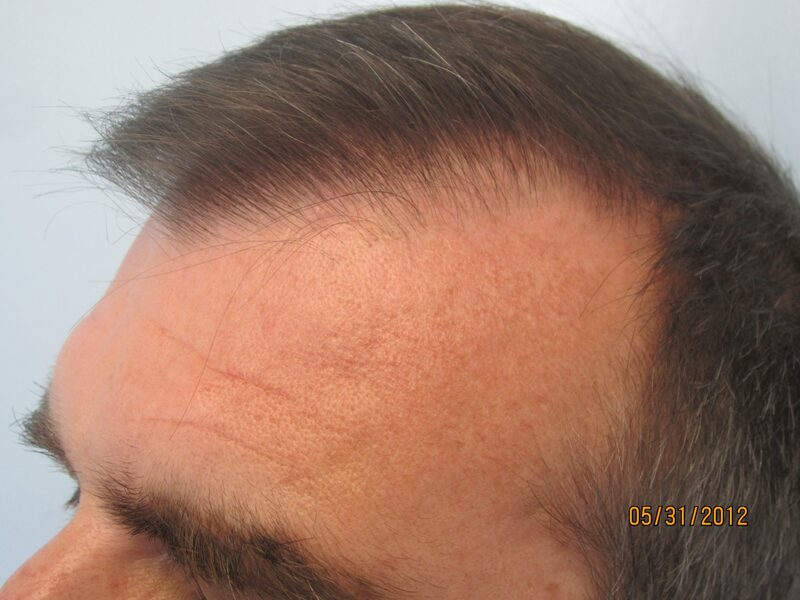 A patient who had the hair line transplanted. As demonstrated, there are natural protrusions to the hairline, making it look natural. Also, the single hair follicles are placed at the hairline so it does not look pluggy. 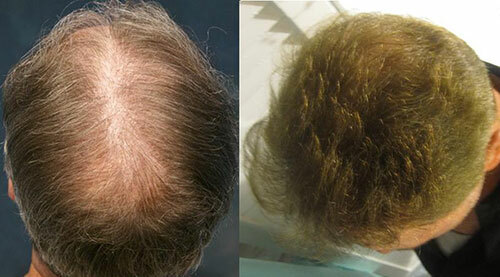 The image above belongs to a gentleman who had 2315 grafts hair transplanted in one session. Yes, Dr. Sean creates a natural non-pluggy hairline, guaranteed. The entire hairline is transplanted. Please notice how natural it looks. All single hair follicles are placed in the frontal hairline followed by two and three hair follicle behind it. No one would notice that the entire hairline is transplanted. After the hair transplant procedure, hair starts growing by about 3 months. They will grow 1 inch every 3 months. So, by the 10 to 12 months, you will see about 2 to 3 inches of hair growth. In general, it will take a good one year to see the full result. Are there any hidden fees on the day of the procedure? No, there are no hidden fees. We are very upfront with our costs. We present you with all the costs at the consultation. We do not overcharge or have any surprise charges on the day of the procedure. Does Dr. Behnam have any video testimonials of patients who had hair transplant done? 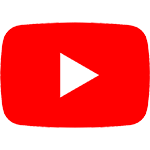 Please click on below videos to watch real patient testimonials. Does hair transplantation use my own hair? Yes, we use the hair from the back of scalp. The hair in this area is permanent, meaning that it does not thin out in about 90% of the population. In order to find whether you are a candidate, Dr. Sean will analyze your scalp using a video microscope as well as densitometer at the consultation. I have grey hair, am I a transplant candidate? Yes, we specialize in all kinds of hair color. We have special microscopes and special lights that we utilize during our procedure that makes it possible to perform hair transplantation on grey hair. The image above belongs to a gentleman with grey hair who had a hair transplant. The left is the before picture and the right is the picture taken one year after hair restoration. Yes. There is no general anesthesia used. You may also sleep during the procedure or watch a movie. I am from out of state, are there any accommodations available? Yes, there are two hotels adjacent to the practice. For those from out of the city, we will cover half the price of your hotel stay. Could hair transplant be done for women? Yes, the women in the below picture had over 1,800 grafts placed to thicken the mid scalp and the front. Where is the hair transplant procedure performed? 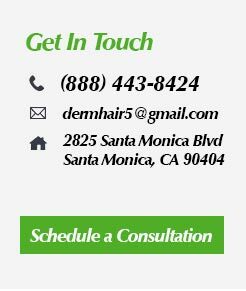 The hair transplant procedure is performed in our beautiful office in Santa Monica. Will I be able to contact Dr. Sean directly? Yes, every one of Dr. Sean’s hair transplant patients get his direct cell phone number. This way, he can be reached 24 hours a day without going through any secretary or answering exchange. Does Dr. Behnam have any published articles? Yes, Dr. Behnam has been published in Skin Med, Skin Pharmacology and Physiology, Cutis, Journal of Drugs in Dermatology, Journal of American Academy of Dermatology, Psoriasis Forum, Expert Opinions in Pharmacotherapy, and the Journal of Organic Chemistry.